I arrived at the spectacular ‘Wick Lane’ (a joint development, between three of the south’s most inspiring property design experts), to find out what goes into a project of such stunning stature. Shan and Matt at WCR management instructed Architects Anders Roberts Cheer and Jigsaw interior architecture to design this stunning property inside and out. Completed in May 2016, this contemporary upside down house, of 3500sq feet of modern living space, sits in an elevated position above Tuckton Tea Gardens and enjoys far reaching views of the River Stour and beyond to Christchurch Priory. 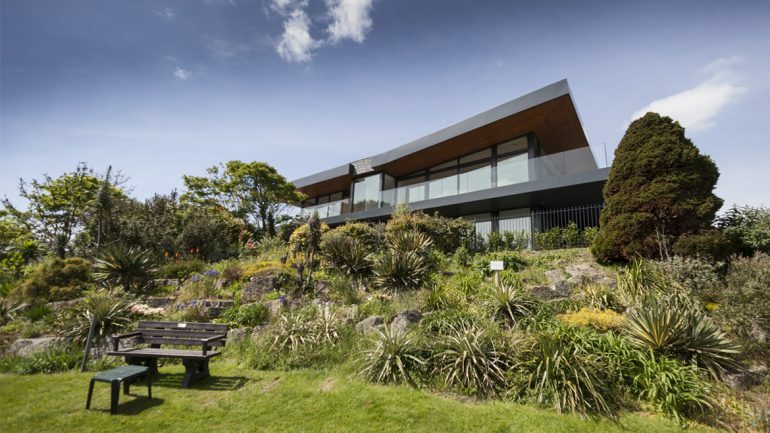 It’s a visually pleasing contrast between the modernity of its linear frame, within a rustic and rocky setting – cutting through the established natural surroundings. The landscaping not only heightens the impact of this house, but also anchors it into the surround area making it feel as if it had always been there. This stunning development, has been built by WCR Management: a local developer whose focus has been mainly high quality flatted developments. More recently they have been striving to create uniquely boutique homes in the Bournemouth and Poole area. Some time ago, whilst enjoying a drink on the banks of the river Stour, they hit upon the idea of building in Tuckton, capitalising on this up to now, beautiful yet un-utilised location. They went on to find the ideal plot: a small bungalow with a view of Christchurch priory that few private homes enjoy. Unafraid of a challenge they set about creating a truly unique and bold house; confident this would be a landmark for not only themselves, but equally for the surrounding community. Impassioned for what this could become, they turned to Anders Roberts Cheer architects and Jigsaw Interior Architecture to bring this idea to life. Both Dorset practices already had good working relationships with each other and understood the local market. Strongly influenced by the iconic American architect Frank Lloyd Wright, the exterior design is dramatic in its simplicity, and although a cutting edge contemporary home, the elevations are softened with a palette of natural materials, which enable such an uncompromising modernist solution to respect its setting. The predominately glazed elevations dramatically enhance the use of a butterfly roof, which it itself adds to the drama when experienced from inside. While Anders Roberts Cheer had fully embraced the bold iconic design with unabashed vigour, it was the turn of Jigsaw to create an interior truly worthy of ARCs design. A limited palette of greys and whites used with warm timbers externally and internally, ensures the house has a continuity of design. Upon entering I am first taken with how light and spacious the hall is. A herringbone white oiled oak floor guides you through to the four comfortably sized bedrooms, bathrooms and the impressive master suite. Everything in this property is carefully considered and bespoke made, even the lighting. A detailed lighting design was provided by Jigsaw working closely with the lighting contractor. The feature staircase was custom-made, with a carefully arranged geometrically detailed pattern, that shatters light through metal balustrade, creating a myriad of light patterns that dance through the space as the sun moves around the building. This light dynamic reverses at night when the interior of the building provides the light source and the pattern can be enjoyed from the exterior and surrounding gardens. As you carry through to the first floor you are immediately greeted with the interconnected living and entertaining space, a key element to modern day living. A wide and generous terrace wraps around 2 full elevations, so when the glazing is fully open it increases the living space significantly. The kitchen is the key to the success of the open plan living space. Contemporary suede finish grey doors and walnut splash backs sit in stark contrast to the clean white Silestone worktops. Finally, the living space opens up and the roof rises up to a towering height of 3.3m, framing the view beyond. A 3.5m wide fire with a limestone hearth adds to the dramatic impact of the space. Surround sound ceiling mounted speakers in all rooms and lighting controls add that little extra touch of luxury that the crème dela crème of modern home just couldn’t be without. WCR Managements’ conviction to build to the highest standard, to embrace the different and work with people with discernment and passion, has resulted in a building of a standard unseen in this area before. Setting a standard for not only their future projects, but for other luxury homes in the local area. Indeed having viewed the designs and specifications of their current Minterne Road project in Poole; which boasts views over Sandbanks and Brownsea Island, it is easy to see why one of the three luxury properties have already been snapped up off plan by an eager buyer. It would appear that the WCR – ARC – Jigsaw magic seems to be working already.